Town's Gabriel Johnston in action against Buxton. brighouse town manager Vill Powell has admitted that the club’s summer transfer business is all but complete. 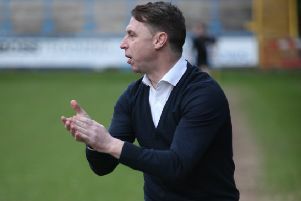 The Town gaffer says he is still on the lookout for at least one new player before Brighouse kick off their Evo-Stik East 2018/19 campaign at home to Gresley FC on August 18. But, according to Powell, any new signings are unlikely at this stage. “Unless something drops out of the sky,” said Powell when asked if there would be any new arrivals. “I am on the look out for a left-footed wide player and we have a few options available to us. So in someways I could be contradicting myself. Brighouse’s latest pre-season preparations saw Powell’s side host Buxton at the Yorkshire Payments Stadium on Tuesday evening. Town were outclassed by the Evo-Stik Premier League side as they were beaten 3-0. The visitors took the lead after only three minutes as from a corner the ball found its way into the net via a Brighouse defender. Town matched their higher-ranked opponents thereafter as the score remained at 1-0 until 10 minutes from time. A trialist from Buxton struck to give the away side a two-goal cushion. Brighouse responded well and almost halved the deficit only to be denied by the crossbar. With three minutes remaining Buxton sealed victory as substitute Bradley Grayson fired home. Town have no game this weekend with their next friendly scheduled for Tuesday evening. They travel to Penistone Church who ply their trade in the Northern Counties League. In other news, Bradford City boss Michael Collins attended last Friday’s re-branding and relaunching of Brighouse’s new stadium and away kit - which are both sponsored by Yorkshire Payments. The company also back the Bantams, sponsoring their tracksuits and training kits. There were discussions held between Town’s David Rowland, James Howard and Collins in regards to a possible pre-season friendly. If a fixture can be arranged the likely date would be August 7.